A unique picture “has been created” for each phonetic sound. You will be getting 329 multi-colored ($50 Economy 5.5x3.5) or ($89 Large 8.5x5.5) pictured phonetic reading sounds on flash cards. Our self-taught DVD reading program works best with the flash cards, but the flash cards are NOT required for the DVD pictured reading program. The flash cards have 4 additional sections. The flash cards are on 100 lb. cardstock. The flash cards are a “hands-on reading tool” for teachers. 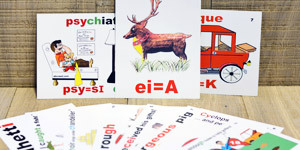 The flash cards are an additional medium of learning for those who have reading problems. The flash cards give you the opportunity to stack together the sounds that need to be learned. The flash cards can be used independently or with the DVDs. Plurals: Different forms of plurals and how plurals are formed. Homonyms: (Homonyms are words that sound the same but have different meanings. Ex: there, their, they’re.) We have given a definition to 39 homonyms, and created a picture that describes the different words. Possessions: Where to place the apostrophe when using possessions. Prefixes: We have given a definition with a picture of the most used prefixes.